This is another musical where Fred Astaire and Ginger Rogers steal the show in supporting roles. It was their first film together, and from the first scene it is clear what a perfectly matched pair they were! Dolores del Rio and Gene Raymond are their leads this time around, starring as womanizing hotel band leader Roger and the Brazilian apple of his eye, Belinha. Fred and Ginger are members of the band, a bit fed up with Roger’s womanizing, as it keeps getting the band fired. Roger hatches a plan to take the band to Rio de Janiero, escorting Belinha in his very own plane and planning to meet the band there in a few days. A mechanical failure leaves Belinha and Roger temporarily stranded, and a love triangle emerges as Roger begins to fall for her but learns that she is already engaged to another man. 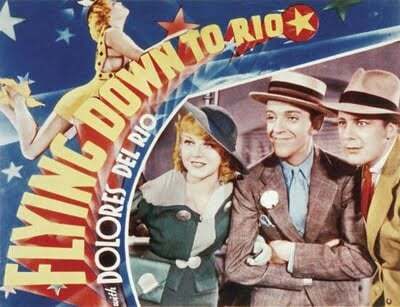 Flying Down to Rio is a great but very fluffy little pre-code musical. Released in the middle of the Depression, it is quite obviously meant to give the audience laughs and provide a distraction from the dismal state of the world for an hour and a half. It’s not a brilliant piece of art and it doesn’t have much substance, but it is certainly exciting. All of the somewhat shocking little elements of pre-censorship films are apparent here. Sly one-liners and double entendres pop up frequently in the dialogue. Some of the most witty come from Dolores del Rio, though Ginger has fantastic and sarcastic dialogue as well. Scandalous sheer blouses are sometimes worn by the dancers. While Fred and Ginger are undeniably the most captivating pair in this film, Dolores del Rio stands on her own as a great performer and stops them from completely overtaking the film. Still, it’s hard not to be out-shined by that magnetic twosome. In typical Astaire and Rogers fashion they’re ultra-charming, they play perfectly off of each other and their musical numbers are a complete delight. Flying Down to Rio is a fun musical which boasts a lovely and charismatic cast.